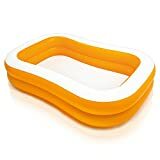 The Inflatable Cheeseburger is One of Our Favorite New Kiddie Pools This Summer! It wouldn’t officially be summer without having to replace your kiddie pool a couple of times. Well, now you have an excuse to buy a few of them thanks to these new inflatable pools that come as a cheeseburger, a watermelon, a donut, rainbow, and more! Splash this way! Who’s ready to kick off summer the right way this year? Last year it was all about the giant swan and unicorn pool floats and this year, well, it’s about the cutest inflatable kiddie pools that you’ll almost want to eat. But don’t. One of the most popular ones that’s already blowing up online (pun kind of intended) is the giant cheeseburger. Having your kids swim in anything else but a cheeseburger this summer is kinda pointless. 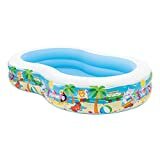 We’ve round up some of the best-of-the-best inflatable pools for the kiddos, including some that can fit the family (go in if you must) an even one that comes with a filter pump. It’s really the first step before you put in that actual pool. Here are some of our favorites (so far) in 2019. They’re officially calling it a hamburger, but we’re totally seeing cheese in there so it’s a cheeseburger to us. Either way, it’s cute, inflatable, and over 5-feet wide! This one is also pretty easy to clean, deflate, and store away when it’s time to put it away after the summer is over or, you know, when you’re all just ready for a break. They’ll have a blast splashing around in this watermelon pool (yes, with seeds) all summer long. It’s five feet wide so it’s pretty perfect for toddlers and the littler ones starting around 12-months old and older. Hey, you can even sit in there with them. Suns out, guns out? Ok so this one definitely looks good enough to eat. Don’t be surprised when you see the kiddos trying to lick the frosting, especially as you start blowing it up. Who doesn’t love a strawberry frosted donut? We’re keeping our fingers crossed that they’ll come out with the chocolate frosted options because, chocolate. Keep them totally on trend this summer with the cool AF banana leaves pattern! Sadly this rainbow option doesn’t come with a pot of gold at the end of it. Hey, we say just add one yourself. Like most others, this one is over 5-feet wide so can easily fit a couple of kiddos or, like, 2 adults. Whatever happens, happens right? Grab this one while you can because it keeps selling out. What can we say, people love rainbows. Ok so now they’re starting to get a big bigger, which is great because you can fit a family in there! This one is for ages 3 and older, holds 169 gallons of water (12-inches), and inflates with 2 different air chambers so you can get the job done faster. 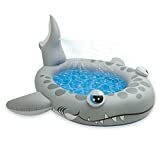 This one is currently the ‘Amazon Choice’ for inflatable pools this summer. We love the orange color that really stands out in a sea of blue. It can hold 137 gallons of water (13-inches), and is pretty easy to inflate. This one if for the older kiddos, with the recommended age of 6+. It’s also big enough to fit the whole family unless, you know, you have a family of like 10. Ok so now we’re getting into the bigger guns! 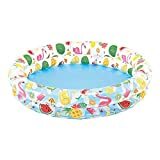 This is one of the best options when you’re looking for something a bit more substantial but, you know, you’re not ready to put in the real pool quite yet. It’ll be ready to fill with water in just about 10-minutes and even comes with a filter pump so you and the entire family can enjoy fresh and clean water each and every day. You’ll actually be pretty surprised at the price of this one. Very affordable. 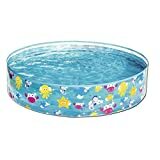 If you’re ready to graduate from your standard kiddie pool, give this one a while. The one pictures above is 6-feet wide, but also has a version that’s 10-feet wide for larger families or those of us who just want more room to splash around. It’s super quick setup and even has a drain plug that helps make it easy (and fast) to get rid of the water when you’re done with it. Intex Crystal Blue Inflatable Pool, 45 x 10"
The Giant Party Bird Island Swan & Flamingo Float Fits 6 People! These Air Conditioners are on Sale Right Now! Your Kids are Begging for Just About All of These New Toys!